“How much will new rain gutters for my home cost?” It’s a question we hear often, and the short answer is around $1,780, for the average Maryland home. However it does depend on several things, but this guide is intended to assist you in your shopping by offering some basic guidelines. Gutters are often an afterthought to a roofing or siding project, but few components of your home are more important. Your gutters channel all that rainwater off your roof and direct it – if they’re properly designed and installed – away from your home’s foundation. Home rain gutters have been made of many different materials over the years: galvanized steel, copper, vinyl, even wood. For our purposes we’ll discuss aluminum gutters, which are the choice of the vast majority of homeowners. Aluminum is lightweight, durable, doesn’t rust (or turn green like copper), doesn’t become brittle over time like vinyl, and is generally the most cost-effective option in gutters. 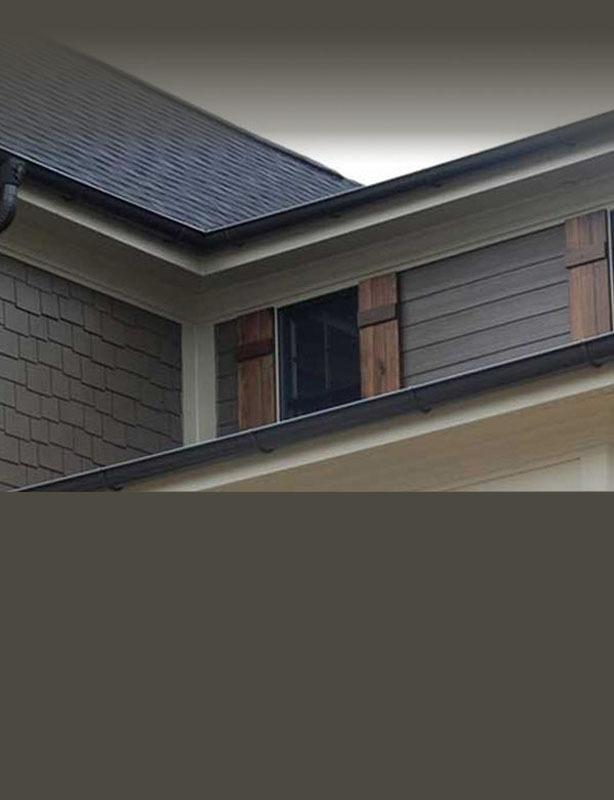 When we talk about “gutters” for your home, there are generally two major components: the gutters, which run horizontally along the edge of your roof, and the downspouts, which run vertically to deliver the rainwater to ground level. There are various other parts to connect the sections and fasten them to your home, but gutters and downspouts will account for the majority of the cost. 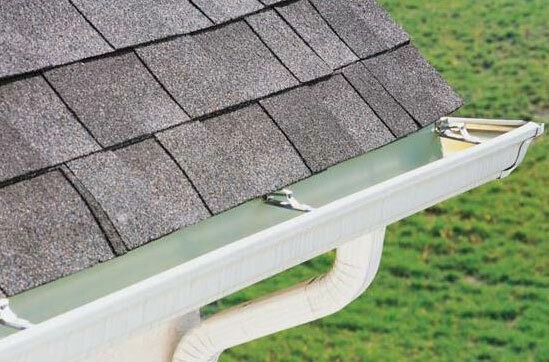 Most residential rain gutters are 5 inches wide, but for larger roofs or those that are more steeply pitched, 6-inch gutters may be necessary to handle the runoff. A wider gutter will require a bigger downspout. Don’t skimp here: a sudden storm can quickly overwhelm an undersized gutter and cause water damage to your home. Similarly, white gutters and downspouts look great on most homes, but yours may look better with a beige or brown color. Color choice will affect the cost as well. Labor for the project may vary somewhat also … it’s more complicated and time-consuming to install gutters on the third story of a home than on a rancher where they’re 10 feet off the ground. 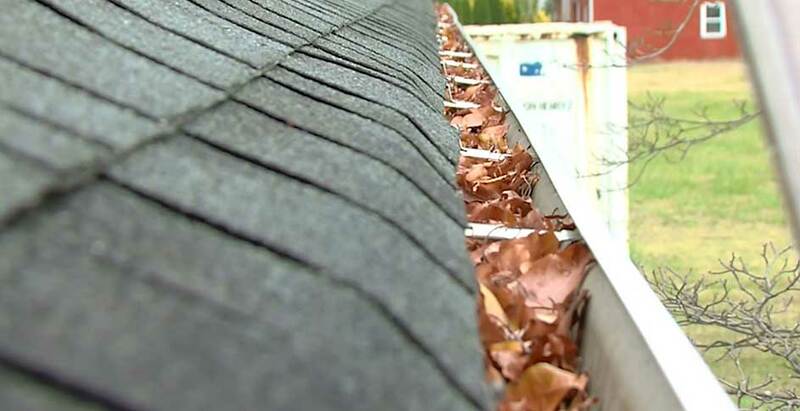 The final wild card in the cost is the addition of a gutter guard system to keep leaves and other debris from clogging your system. Cleaning gutters is a dirty job at best and a very dangerous one at worst; a quality system that allows water to enter your gutters without all the leaves can be a great investment in your own safety. So that’s why the answer is, “It depends.” The cost of your gutter system will depend on not only how many linear feet of gutters and downspouts but their size, color and whether or not you’ll add a gutter guard system. However, based on AROCON’s database of projects completed on Maryland homes, we can tell you that most gutter replacement projects will fall within a range of $8 to $12 per linear foot. That includes labor and material to install the gutters, downspouts and all the accessories needed to connect them together. Gutters are often an afterthought, but they shouldn’t be. A properly installed gutter system can pay for itself many times over in the damage it prevents.